It's an unfortunate fact of fiction that if you pick a particular genre, you'll be compared ceaselessly with previous works. 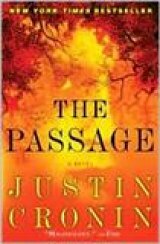 Ballantine is promoting "The Passage" -- the first volume of a projected trilogy -- with the hype associated with Hollywood tent-pole movies: A $3.75 million auction for the three-book deal; rights sold to 26 countries, six-figure printing run; Ridley Scott of Scott Free Productions paying $1.75 million to make the movie, etc., etc. In short, Justin Cronin. born in 1962, is one rich English professor! Stephen King provides a jacket blurb for novel by Cronin, a fellow native New Englander, who teaches English at Rice University. He has a precedent: George R. Stewart (1895-1980) taught in the English Department at the University of California-Berkeley and published memorable and best-selling books such as "Fire," "Storm" and "Ordeal by Hunger," a chronicle of the Donner-Reed party. Ballantine touts "The Passage" as the first volume of a vampire trilogy, with part two scheduled for publication in 2012 and the final volume in 2014. A brief excerpt from the second volume of the trilogy, "The Twelve," is included at the end of the paperback edition. "The Twelve" will be published in 2012. The vampire part is technically correct, but a little misleading; the survivors of the military biological experiment gone horribly wrong who aren't affected are constantly fighting vampire mutants who remind me more of George Romero's zombies than the vampires of "True Blood" or "Twilight." "The Passage" also draws on themes dominant in Richard Matheson's 1954 novel "I Am Legend" (filmed as "The Last Man on Earth" in 1964, "The Omega Man" in 1971, and "I Am Legend" in 2007) and Michael Crichton's "The Andromeda Strain." Both authors used the plot point of a biological experiment gone wrong. Cronin's experiment is a serum discovered in the jungles of South America that will heal wounds quickly, allowing soldiers to return to battle. The serum is subsequently tested in a super-secret compound in Colorado on death row prisoners who've volunteered to escape the needle, only to get a needle of another kind. FBI agent Brad Wolgast and his partner Doyle are delegated to get the twelve "volunteers" for the experiment and they're also told to kidnap six-year-old orphan Amy Harper Bellafonte from a Memphis, TN nunnery. Amy is, in many ways, the counterpart of George Stewart's Isherwood "Ish" Williams in "Earth Abides" -- appearing throughout the novel -- and undoubtedly in the subsequent books. Amy has the agelessness of the original virals and those infected by them, without their mindless hunger. Echoing Stewart's band of survivors in Oakland, California, Cronin creates a Colony of survivors in Southern California who fight the "virals," "smokes" or "dracs" with crossbows and banks of lights to repel them. In Cronin's dystopia, Jenna Bush rules a more or less independent (again) Texas, whose capital is the Hill Country town of Kerrville. All the big cities of the Lone Star Republic have been destroyed and the former state is protected by military forces. It's no better in the rest of the country: gasoline is $13 a gallon and New Orleans has been destroyed by a series of Hurricanes and is a military site. It remains to be seen whether today's readers, living in a sound-bite, Twitterite attention span world, will be attracted to an almost 800-page post-apocalyptic science fiction novel. I'm guessing it will be purchased by science fiction fans, while others, perhaps many others, will read reviews like mine and decide to pass on it. The BP oil gusher is more than enough real-life disaster for many potential readers. For my part, I admired Cronin's book for its characterization and plotting; he's done a magnificent job and I'm looking forward to volumes two and three. About the Author: Justin Cronin is the author of "Mary and O'Neal, which won the PEN/Hemingway Award and the Stephen Crane Prize, and "The Summer Guest." He earned his MFA from the Iowa Writers' Workshop and teaches English at Rice University in Houston, TX, where he lives with his family.